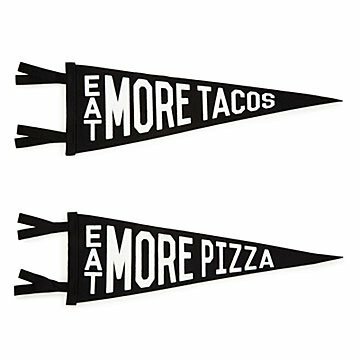 Root for your favorite food with these pennants that celebrate the real winners: tacos and pizza. Team taco was winning by a pico de gallo touchdown, but team pizza's cheerleaders had the cheesiest cheers. Bring a little humor to your decor with these vintage-inspired pennants that have a tasty twist. Pinned up in your dining room, kitchen, or bedroom, you'll show guests you're a team player. Because in the game of grubbing, everybody wins. The part playful, part old-school cool designs make a great gift for foodie friends, and satisfy the craving for fun decor. Made from felt and wool in Pennsylvania.